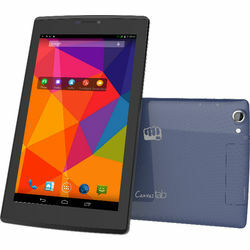 Micromax Canvas Tab P480, meet this brand new calling tablet which is driving everyone crazy. Micromax launched its amazing calling tablet in April, 2015. The Canvas Tab P480 with big screen and lightning fast performance gives true meaning to entertainment. Customers believe it is one of the best tablets in its budget range, making room for all sorts of entertainment. The all-new Micromax Canvas Tab 480 is a calling tab with 17.78cm (7) IPS screen and Quad Core Processor for lightning-fast performance. It will make your experiences of watching movies, listening to music, playing games and much more a sheer delight. This amazing tab comes with an immersive display of 17.78cm (7 inches) and an IPS screen with resolution 1024* 600 WSVGA for sharper, clearer and brighter view. It measures 194 mm x 112 mm x 10.3 mm and weighs as light as feather, just 284g. Juggle between the apps seamlessly with the 1.3GHz Quad Core Processor and 1GB RAM of the Canvas Tab P480. The tab runs the Android KitKat 4.4.2 OS (upgradeable to Lollipop) with Integrated Google Drive, Launch voice searches: 'Okay Google! ', Hangouts App and more for a smoother UI. Capture bright pictures all day and even at night with an auto focus and flash enabled 5MP rear camera of this calling tab. There is also a fixed-focus front camera of 2MP to click amazing selfies. Also, enjoy 720p of HD recording and playback. This dual SIM (GSMᤣ) tab comes with 3G connectivity and offers you the freedom of browsing the internet, sharing your favourite content and more wirelessly via Wi-Fi and Bluetooth 4.0. The tab holds an internal memory of 8GB, which can be further expandable up to 32GB to carry your favourite music, movies and games with you always. It is powered with a marathon battery of 3000mAh that offers 9 hours* of Talk time, 3 hours* of Browsing time, 3.5 hours* of Video playback time and 69 hours* of standby time. Micromax Canvas Tab P480, meet this brand new calling tablet which is driving everyone crazy.Micromax launched its amazing calling tablet in April, 2015. The Canvas Tab P480 with big screen and lightning fast performance gives true meaning to entertainment. Customers believe it is one of the best tablets in its budget range, making room for all sorts of entertainment.Pros ConsAndroid Kitkat 4.4 5.0MP Rear Camera 1.3 Ghz quad core processor7 inch IPS screen3000 mAh batteryThe all-new Micromax Canvas Tab 480 is a calling tab with 17.78cm (7) IPS screen and Quad Core Processor for lightning-fast performance. It will make your experiences of watching movies, listening to music, playing games and much more a sheer delight.Design & Display This amazing tab comes with an immersive display of 17.78cm (7 inches) and an IPS screen with resolution 1024* 600 WSVGA for sharper, clearer and brighter view. It measures 194 mm x 112 mm x 10.3 mm and weighs as light as feather, just 284g.Processor & OS Juggle between the apps seamlessly with the 1.3GHz Quad Core Processor and 1GB RAM of the Canvas Tab P480. The tab runs the Android KitKat 4.4.2 OS (upgradeable to Lollipop) with Integrated Google Drive, Launch voice searches: 'Okay Google! ', Hangouts App and more for a smoother UI.Camera Capture bright pictures all day and even at night with an auto focus and flash enabled 5MP rear camera of this calling tab. There is also a fixed-focus front camera of 2MP to click amazing selfies. Also, enjoy 720p of HD recording and playback.ConnectivityThis dual SIM (GSMᤣ) tab comes with 3G connectivity and offers you the freedom of browsing the internet, sharing your favourite content and more wirelessly via Wi-Fi and Bluetooth 4.0.Memory & Battery The tab holds an internal memory of 8GB, which can be further expandable up to 32GB to carry your favourite music, movies and games with you always. It is powered with a marathon battery of 3000mAh that offers 9 hours* of Talk time, 3 hours* of Browsing time, 3.5 hours* of Video playback time and 69 hours* of standby time.